Obituary for John Joseph Nabel, Sr.
JOHN JOSEPH NABEL, SR., 85, of Jackson Twp., NJ passed away on Saturday, November 25, 2017, at Concord Health and Rehabilitation in Lakewood Twp. John was born in New York City, NY, had resided in the Bronx, before settling in Jackson Twp. 54 years ago. John proudly served in the United States Army during the Korean War as a medic and received the Purple Heart and the Korean Service Medal. John worked for the Tennaco Chemical Company in New Brunswick, NJ as machine mechanic for 30 years, retiring in 1981. In addition, John was a communicant of St. Aloysius Roman Catholic Church in Jackson Twp. John was predeceased by his parents, Gustave and Anna Nabel; his brothers, Gustave, Robert “Oscar”, Eugene and Thomas; and by his sisters, Evelyn, Anna and Margaret. 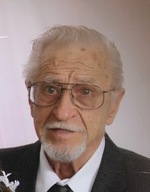 He is survived by his wife of 65 years, Catherine; his daughter, Michelle Shepard and her husband, Eugene of Jackson Twp. ; his sons, Gus Nabel and his wife, Jill of Jackson Twp. and John Nabel and his wife, Mary of Chatsworth; his grandchildren, Eugene, Jennifer, Gus, John and his wife, Ika, Lucy, Harrison and Katie; his 7 great grandchildren; his sister, Emma “Lee” Fettel of Chicago; his sister-in-law, Rose Nabel of New Jersey; and by his many nieces and nephews. Relatives and friends are respectfully invited to attend his visitation on Wednesday, November 29, 2017, from 3-7 PM at The GEORGE S. HASSLER FUNERAL HOME, 980 Bennetts Mills Rd., Jackson Twp., NJ. A funeral gathering will be offered on Thursday, November 30, 2017, at 8:00 AM at the funeral home. His Funeral Liturgy will follow at 9:15 AM at St. Aloysius Roman Catholic Church, 935 Bennetts Mills Rd., Jackson Twp. Interment with military honors will follow in The Brig. Gen. William C. Doyle Veterans Memorial Cemetery, 350 Province Line Rd., Arneytown, NJ. If so desired, memorial contributions may be made in the memory of John to the COPD Foundation, 3300 Ponce de Leone Blvd., Miami, FL 33134 and would be greatly appreciated. For directions, further information and to send the family condolence messages, please select a tab on the left.